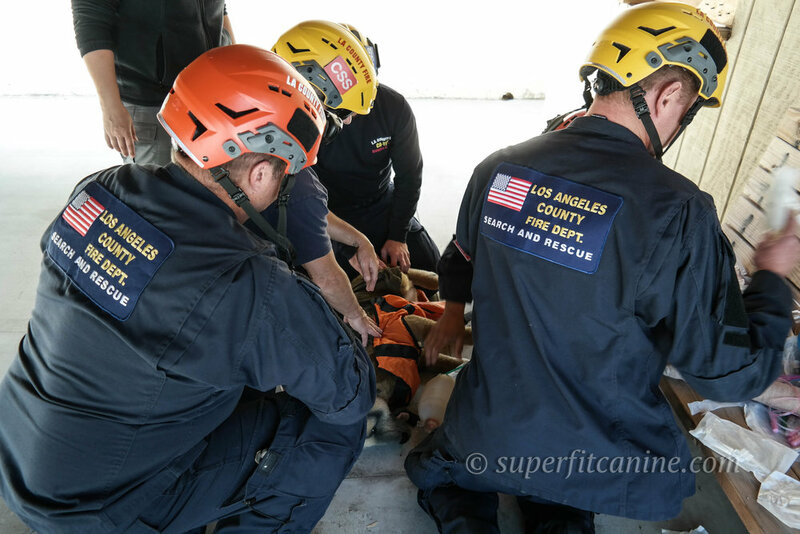 May 31-June 1, 2017: Search and Rescue K9 Handlers, and US&R Medical Specialists came together at the Ventura County Fire and Police Regional Training Center in Camarillo, CA to learn skills that may one day save the lives of one of their K9 team members. 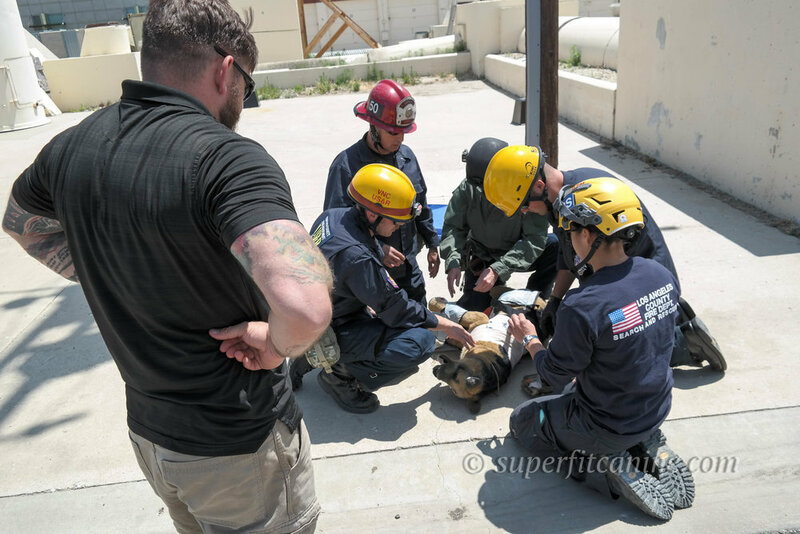 The 2-day course incorporates current TCCC (Tactical Combat Casualty Care) and TECC (Tactical Emergency Casualty Care) guidelines with K9 specific anatomy and physiology to provide the most up-to-date life saving information available for working dogs. 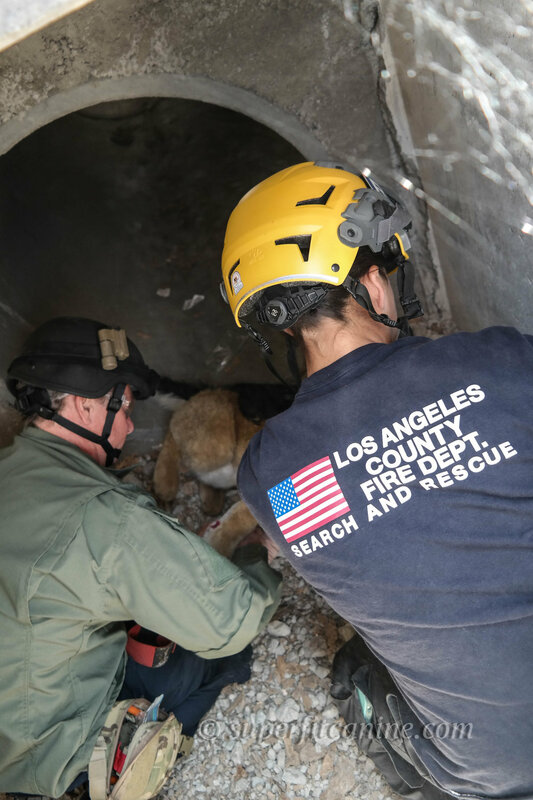 Training includes multiple interactive, casualty response situations in simulated tactical environments, using canine mannequins and other realistic training aids in dynamic scenarios. Course instructors are provided by Veterinary Tactical Group. Students learn how to approach the assessment and treatment of a working dog during a hazardous point of injury scenario. 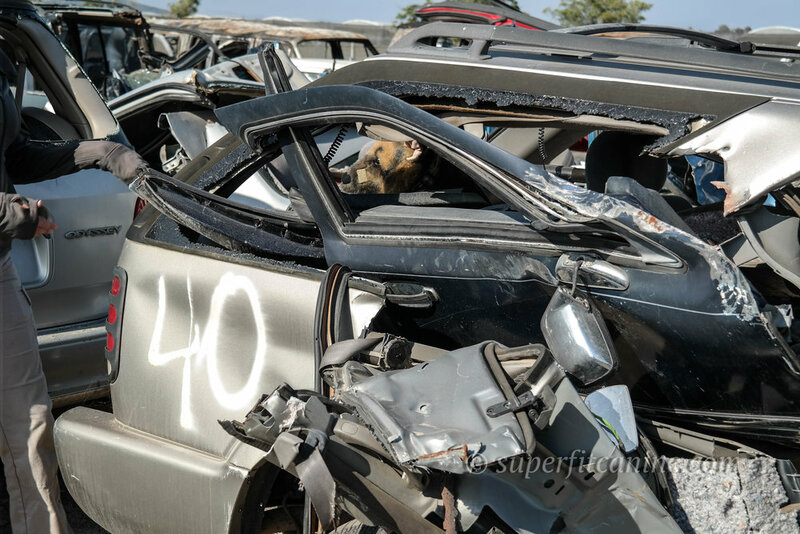 Students assess a K9 mannequin with simulated injuries from a vehicle accident. Students learn about k9 medical planning, and during medical evacuation, students deliver their injured working K9 (mannequin) to a simulated veterinary hospital. Students practice life-saving skills on a K9 mannequin at a simulated casualty collection point during a poly trauma injury scenario. Students evacuate their injured working K9 (mannequin) during an injury scenario. Students assess and respond to an injured search dog (mannequin) in a confined space during a direct-threat scenario. Students perform a secondary assessment after evacuating their injured working K9 (mannequin) from a direct-threat scenario. 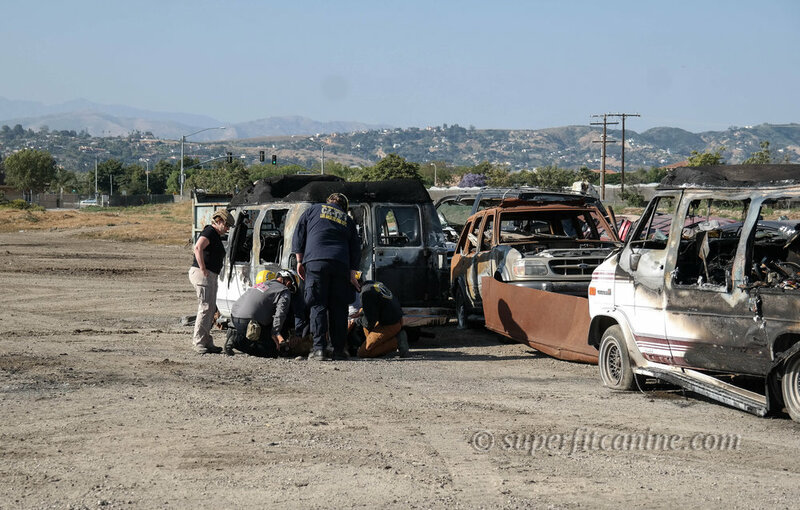 A special thanks to Ventura County Fire Department and Regional Task Force 7 for their assistance in bringing this valuable training to the Ventura County area. We'd also like to thank Spencer Mackenzie's and On Duty Uniforms for their generous sponsorship of meals for this event. 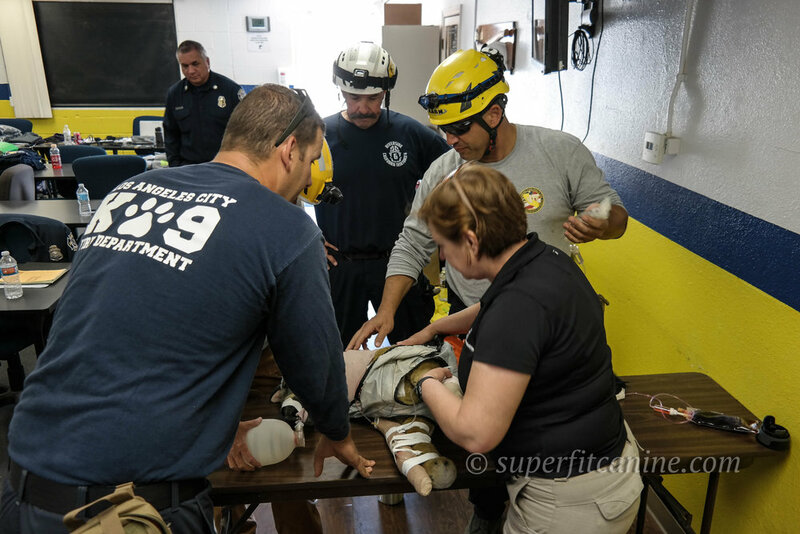 Superfit Canine hosts K9 TECC Courses like this, and other US&R training events all over the country. Visit our Event Page for details. Interested in this course for your K9 handlers and/or medical specialists? Contact us directly at superfitcanine@gmail.com for information on how you can host a class in your area.